The density of air, ρ, is the mass per unit volume of Earth's atmosphere. There are several factors which can affect air density, these being temperature, humidity and altitude. As with most other gases, solids and liquids an increase in temperature causes particles to begin moving more and thus usually maintain a greater average separation. This is what causes the expansion in the air and the variance in the density of air. 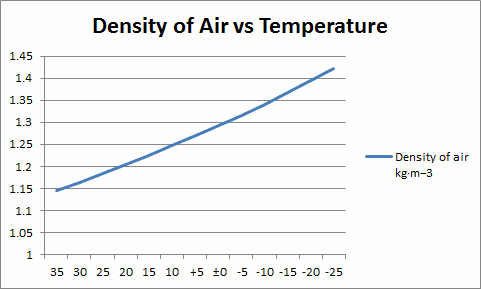 Graph shows relationship between Air Density and Temperature (°C) at a constant pressure. The addition of water vapor to air reduces the density of air, this is due to molecular mass differences between water and air. As Avogadro's Law states at a given temperature and pressure, the number of molecules present is constant for a particular volume. This means that as water molecules begin to mix with the dry air the air molecules must also decrease by the same number.